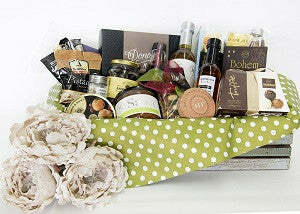 Gift hampers are such a lovely way of saying thank-you or sending someone your thoughts & wishes on special occasions. Our gourmet hampers are filled with delicious treats and an assortment of goodies that are sure to tantalise the taste buds. We also have a beautiful range of hampers to send on the occasion of a new baby, or luxury treats for someone you believe deserves to be pampered. At Jacks we love creating gifts that are a pleasure to receive, and convey the thoughtfulness of our customers. If there is something special which does not appear on our website, please contact us as often we can customise hampers to suit you & the occasion.